Tropical Depression 14W was a short-lived storm that only lasted through four bulletins from the Joint Typhoon Warning Center. NASA's Aqua satellite captured infrared data on the storm's cloud top temperatures as it passed over China's Hainan Island and headed toward a final landfall in mainland China. Born in the South China Sea it made landfall in southeastern China on September 8. The Atmospheric Infrared Sounder instrument called AIRS that flies aboard NASA's Aqua satellite captured infrared data on the storm on September 7 at 1:59 a.m. EDT. The AIRS data showed an elongated storm over Hainan Island, China. It also showed cold cloud top temperatures near -63F/-52C that indicated powerful thunderstorms dropping heavy rainfall over the island. The final warning on Tropical Depression 14W (TD14W) was issued on September 8 at 0300 UTC (September 7 at 11 p.m. EDT). AT that time, the center of the depression was near 21.1 north latitude and 111.2 east longitude about 182 miles (293 km) west-southwest of Hong Kong, China. It was moving to the north-northwest at 13 knots (14.9 mph/24.8 kph) and maximum sustained winds were near 25 knots (28.7 mph/46.3 kph) and waning. As TD14W made landfall on September 8 it brought wave heights up to 6 feet (1.8 meters) along coastal areas of southern China. 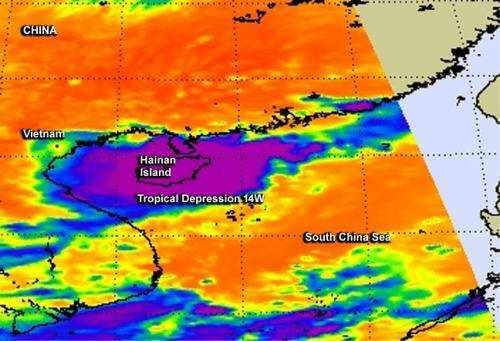 Satellite imagery showed that the remnants of the depression were moving over the northern Gulf of Tonkin, located to the west of Hainan Island and are expected to continue in a north-northwesterly direction until dissipation.